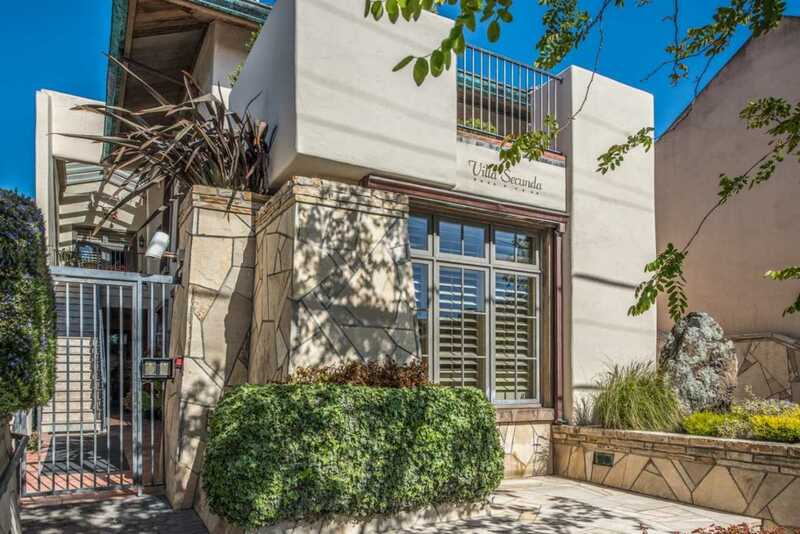 Rare opportunity to own a luxury townhouse right in the heart of downtown Carmel. There are only a couple of these ever built. This is the top level unit with two patios as well as a roof-top deck with a huge view. The ceilings in this unit are exceptionally high and there are windows and French doors everywhere that let in an abundance of light. Limestone floors throughout the living room, dining room, kitchen and hallways. Counter tops in the kitchen, laundry and bathrooms are all limestone. A barrel ceiling in the main hallway adds to the charm of this unit. Each bedroom has it's own full bath. The master bedroom features a huge walk in closet. One of the best features of this townhouse is the huge underground gated parking garage solely for the use of this townhouse and the lower unit. There is a large private elevator from the garage that opens directly into this unit. An additional large storage room is available as well. This is downtown living at it's finest. SchoolsClick map icons below to view information for schools near 0 Dolores 3 SE 7th Carmel, CA 93921. Carmel Real Estate at 0 Dolores 3 Se 7th Carmel, CA 93921. Description: The real estate listing at 0 Dolores 3 Se 7th Carmel, CA 93921 with the MLS# ML81714334 has been on the Carmel market for 284 days and is currently listed for $2,970,000. You are currently viewing the property details of the MLSListings MLS listing at 0 Dolores 3 Se 7th Carmel, CA 93921, which features 3 bedrooms, 4 bathrooms and has approximately 2100 sq.ft. of living area.